What is Talking Bibles Sunday? Talking Bibles Sunday is an easy way for you to share Talking Bibles ministry with your church or congregation. First, order your kit. We have a kit to make your job easier! The kit includes a video to play for your church, easy instructions, and bulletin inserts that you can copy or print to hand out to your congregation. We also have newsletters, bookmarks, and a brochure available. Next, select a date to hold a Talking Bibles Sunday. Once your church has committed to hold a Talking Bibles Sunday, we will send you a sample Talking Bible for you to share with your congregation. 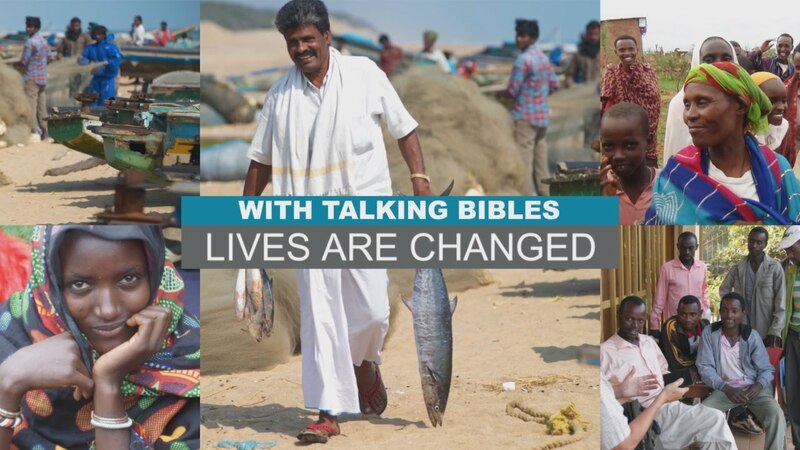 On Talking Bibles Sunday, play our 2 ½ minute video for your congregation, share our literature (optional), and take an offering to place Talking Bibles with people who can’t read. Just a few minutes can help hundreds hear the Word of God! Welcome Video — The Talking Bibles Sunday kit includes a DVD with our short, informative welcome video. Your support of Talking Bibles International makes a difference in the lives of so many around the world who cannot read. We pray your Talking Bible Sunday will be informative, uplifting and touch many hearts in your congregation. Print or share our newsletters with your friends, family, and church. We are a member of Barnabas Foundation, an organization that provides Christ-centered Estate Planning and Planned Giving expertise to generous believers around the country, just like you. As one of our supporters,you have access to their services at no cost and with no obligation. Monthly gifts provide reliable revenue so we can continually send Talking Bibles where they are needed. It’s easy to set up and a hassle-free way to donate each month. Follow us on Facebook and share our posts with your friends. Start a fundraiser on Facebook or a “Givalanche” with your gift. Share the Talking Bible ministry so more non-readers can hear the Word of God. Your gift helps place Talking Bibles with people who can’t read—both to reach those who have never heard the Good News and to help believers grow in their faith and share with others.